Cats communicate in a variety of ways, including meowing, purring, hissing and body language. Sometimes cat communication takes a strange turn. Find out how uniquely cats communicate based on past visitor questions. 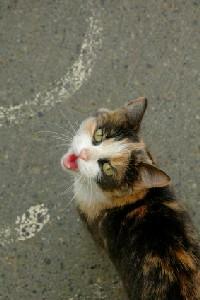 One of the ways that a cat communicates its needs to us is through meowing. A meow can mean so many different things. It can mean that your cat wants to be fed, your cat is saying hello or it can even be a sign of affection. Some cats are more vocal than others, as you've discovered with Lilly. Did you know that cats don't meow at one another in the wild? Meowing seems to be a language they've developed exclusively for communicating with humans. And she will meow at different pitches and in different patterns, depending upon what your cat is trying to communicate to you. Some breeds are more prone to excessive meowing than others, such as Siamese cats. Do not reward the behavior. Ignore your cat when she meows. Only feed her when she stops meowing and is silent for a moment. The same goes for petting her and any play, which should be done only when she is quiet. Cats are smart. She'll get the message quickly. Spend social time with Lilly. Make sure you allot time each day to play with the cat. Keep a routine. Feed her at the same time each day, etc. It can take time to curb an excessive meowing habit, so be patient. If none of these suggestions work, then you have two choices. Find Lilly a new home or find the roommate a new home. I vote for keeping Lilly. I have a mother cat that has had one litter recently of five babies. I also have a yellow, full grown tabby cat that is spayed. The new mother and her one baby we kept were also spayed last week. Everyone is healing just fine, but the momma cat makes this weird noise whenever her baby comes around. The noise is like quick little exhales out her nose. Then, the two cats promptly start rolling around on the floor and "play fight". The momma does not do this with the other, full grown cat. What does that weird, quick breathing mean? Cats are strange creatures, but that's why we love them. It sounds like this is a form of communication between the two cats. Cats communicate in a variety of ways. Although they may use a meow to communicate with humans, most of the language between two cats is in the body language. Cats communicate with one another with tail movement, eye contact and body movements. Watch your cats as they prepare to play. Often, one cat will hunker down, rear in air and wiggle her behind before pouncing. This is a signal that the cat wants to play. Cats do use purring to indicate mood and communicate as well. Perhaps your cat is actually purring but it is loud and broken and sounds like little puffs of air out of her nostrils. I don't think it is anything to be concerned over since the two cats are playing and both seem healthy. It is natural for her to feel closer to her offspring than your other cat and/or to have a different type of relationship with the two cats. However, as her "Mommy", you know her better than I do. If you feel her health might be at risk at all, I recommend you take her back to the vet for a check-up, especially post op. Perhaps mention this behavior to the vet when she goes in to have her stitches removed, if they are not the dissolving type.